Next post: Everyone is rich, no one is hungry or without shelter. What’s the catch? Melt four tablespoons of butter in a little olive oil in a saucepan over medium high heat. When the butter stops foaming, about a minute, add 1/4 teaspoon of ground cayenne and a tablespoon of curry powder. Stir it around for about a minute, and add about a cup of rice. I used what was left of a box of Chinese takeout rice, heated for 30 seconds in the microwave. After about a minute, during which you will suddenly realize that every Filipino you know will take one look and say “That’s just fried rice!” add the flaked, smoked halibut, stir it in, and cook for about a minute. Sieve four hard-boiled eggs through a cheese grater (the big hole, Rob’s tip). Mix half the sieved eggs into what is now kedgeree. 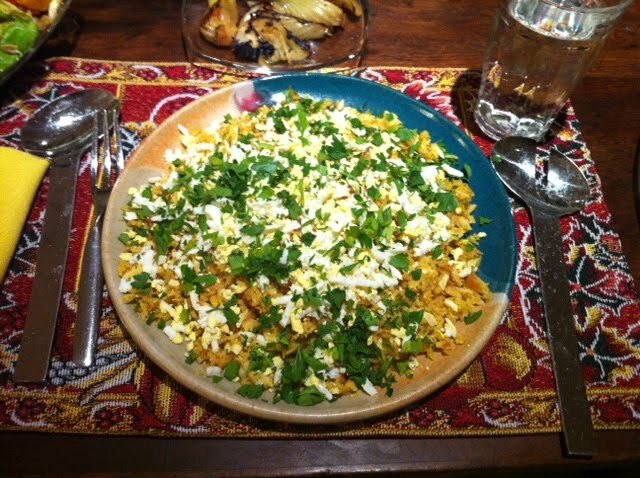 Put the kedgeree on a plate and garnish with the rest of the sieved eggs and some chopped parsley. Serve immediately. It’s really good, and now I’m wondering if it would work with smoked salmon. *The recipe didn’t call for it, but it needed a little salt. Not much, just a shake. *Here‘s the wiki on kedgeree. *The kedgeree recipe above was based on the one on page 42 in the TimeLife Recipes: The Cooking of the British Isles cook book, 1969. We have lovely smoked Michigan salmon readily available at our local grocery (SO lucky to have it close by, they have their own smoker and brick bread oven, among other great things). We might have some kedgeree for breakfast.